If you're on your way to Granville and you don't really know much about it, you don't need to worry — we can fill you in! Granville sits 180 miles (290 kilometers) west of Paris, a well-known city. This area of Manche boasts a population of roughly 14,000 people. If you're organizing a getaway in Granville, you'll want to listen up! You can save tons of money with a Travelocity accommodation and airfare deal. Just select from upwards of 400 airline partners and 665,000 places to stay. Too many choices? We'll make it easy for you! From flights and accommodations to activities and rental cars, we provide 24/7 personal assistance with our Customer 1st Guarantee. If you come across a cheaper deal on another website, we'll refund the difference^. You can adjust your vacation bookings with no extra charges on our end. Do you know what that means? You've got nothing to stress over! And as long as you get in fast, many accommodations don't charge fees either^. Be the early bird that gets the worm when it comes to planning your accommodations in Granville. With 3 places to stay, availability is limited. Check them out and lock in a comfortable room today! There's no better time to spoil yourself than when you're taking a vacation. Book a room at the Mercure Granville Le Grand Large (5 Rue Falaise) and feel like a VIP during your stay. Traveling with a smaller budget? Don't worry, you won't be left in the cold. The Brit Hotel Granville (57 Avenue des Matignon) will keep both you and your savings account happy. Where do you fly into for Granville? Get set for some awesome adventures in Granville. Once you've headed out of Granville - Mont Saint-Michel Airport (GFR), the downtown area will be just 3 miles (5 kilometers) away. Can I rent a car in Granville? Forget buses and expensive cabs. If you plan to do some serious exploring while in Granville, it'd be wise to secure some wheels via Travelocity. We make it so easy that you'll be crafting your road trip playlist in next to no time! If you're touching down at Granville - Mont Saint-Michel Airport and would like to get a car as soon as possible, look into Europcar. It's at 1451 Avenue Matignon, 3 miles (5 kilometers) from the terminal. Drop by Granville Lighthouse, a steadfast building whose light has lit a way through howling storms and inky black nights for generations. Like some more options? Eager to add some greater meaning to your vacation? Go on a pilgrimage to Notre Dame Church of Cap Lihou. Regardless of your beliefs, it's the ideal place to learn a little about the local faith. But that's not all. Think of yourself as an art lover? Treat your eyes to intriguing works and try to interpret the meaning behind them at Richard Anacreon Museum of Modern Art. Visit Granville for its unmistakeable personality and style. Though, there are also world-famous attractions close at hand! Just 18 miles (29 kilometers) away is Saint-Coulomb. Many visitors use this locality as a base to experience the renowned attraction, St. Malo Citadel. 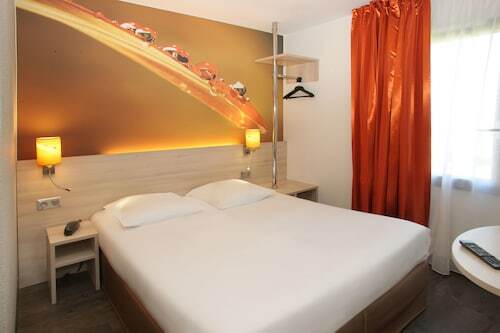 Situated in Granville, this hotel is within 1 mi (2 km) of Port of Granville, Christian Dior Museum, and Avranches-Granville Hospital. Notre Dame Church of Cap Lihou and Granville Old Town Museum are also within 2 mi (3 km). Granville Station is 8 minutes by foot. Offering direct access to the beach, this Granville hotel is within a 10-minute walk of Christian Dior Museum and Port of Granville. 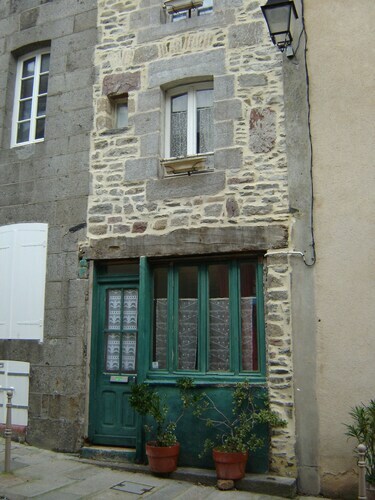 Notre Dame Church of Cap Lihou and Granville Old Town Museum are also within 1 mi (2 km). Granville Station is 14 minutes by foot. Situated by the ocean, this hotel is within a 10-minute walk of Port of Granville, Notre Dame Church of Cap Lihou, and Christian Dior Museum. Granville Old Town Museum and Roc des Harmonies Aquarium are also within 15 minutes. Granville Station is 12 minutes by foot. 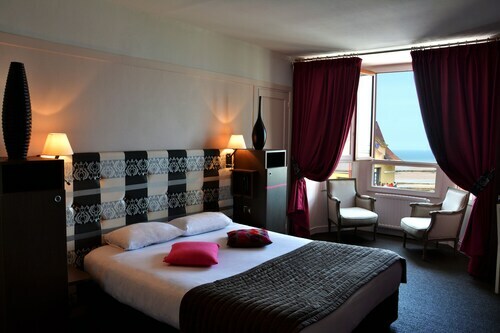 Situated in Granville, this hotel is within a 15-minute walk of Port of Granville and Notre Dame Church of Cap Lihou. Granville Old Town Museum and Roc des Harmonies Aquarium are also within 1 mi (2 km). Granville Station is 16 minutes by foot. 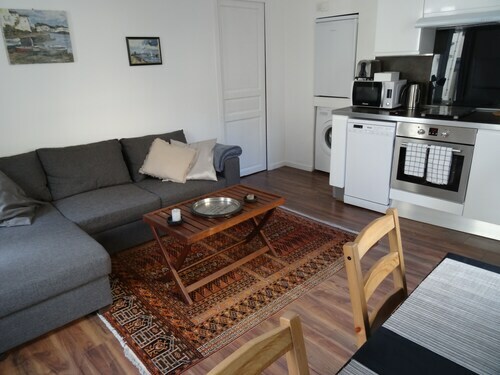 Located in the heart of Granville, this apartment building is within a 10-minute walk of Port of Granville and Notre Dame Church of Cap Lihou. Christian Dior Museum and Granville Old Town Museum are also within 15 minutes. Granville Station is 9 minutes by foot. Located in the heart of Granville, this apartment building is within a 10-minute walk of Port of Granville and Notre Dame Church of Cap Lihou. Christian Dior Museum and Granville Old Town Museum are also within 15 minutes. Granville Station is 8 minutes by foot. Situated in a rural location, this cottage is within a 5-minute walk of Notre Dame Church of Cap Lihou and Port of Granville. Granville Old Town Museum and Roc des Harmonies Aquarium are also within 10 minutes. Granville Station is 17 minutes by foot. Situated in Granville, this apartment building is within a 10-minute walk of Port of Granville, Notre Dame Church of Cap Lihou, and Christian Dior Museum. Granville Old Town Museum and Roc des Harmonies Aquarium are also within 15 minutes. Granville Station is 12 minutes by foot.